You'll be £12.99 closer to your next £10.00 credit when you purchase The Peninsular Collection: 95th Rifles - 1809 to Salamanca. What's this? Order within the next 4 hours, 28 minutes to get your order processed the next working day! 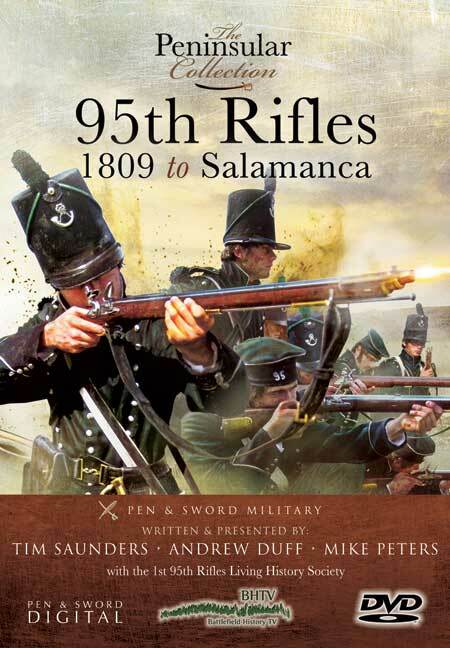 95th Rifles 1809 to Salamanca is the second DVD in 95th Rifles trilogy of films and part of The Peninsular Collection from BHTV and Pen and Sword Digital. The DVD explores the history of the 95th Rifles, who were masters of the battlefield and particularly skilled in skirmishing. Held in high esteem by the French and Allies alike, they played a momentous role in the outcome of the Peninsular War. Following the events set out in the Salamanca DVD, this film serves as a prequel to explain the years leading up to the Battle of Salamanca, starting with the aftermath of Sir John Moore's retreat to La Corunna in the winter of 1808/1809. During the Corunna Campaign of 1808 the two battalions of 95th Rifles proved their both metal and utility on the battlefield. Now in 1809 they were to return to the Peninsular as a part of Wellington's Army. With the Light Division they undertook the epic march to Talavera and over the following three years enduring the hardships of campaign during freezing winters and scorching summers as well as the horrors of the battlefield such as Funtes d'Oñoro as Wellington strove to maintain his army in Portugal. The film concludes in 1812 with the Sieges of Ciudad Rodrigo and Badajoz before the bonds of the defense were finally broken for the British and the 95th Rifles by the Great victory at Salamanca. Filmed on location where the original battles took place over 200 years ago, the BHTV team experience first-hand the diversity of the Spanish weather in winter with rain, sleet, snow and sub-zero conditions, giving the viewer an idea of what the British and French troops had to endure at the time. Complimented by re-enactment footage from the 95th Rifles Living History Society, this DVD is compulsive viewing for all students of the Peninsular War period. This DVD will appeal to a wide audience, not least because of the success of the fictional 'Sharpe' stories and television feature-length films. ... Another outstanding DVD. Pen and Sword Digital and Battlefield History TV formed their partnership in 2008 to provide customers with a wide variety of specialist programmes presented by well-known battlefield historians and qualified guides. The subjects they cover in detail are the First and Second World Wars, The Waterloo Campaign and Peninsular War and they even go back as far as the Dark Ages. Each DVD will be of interest to military enthusiasts, wargamers, battlefield tourists, re-enactment groups, students of particular battles or campaigns and military modellers.